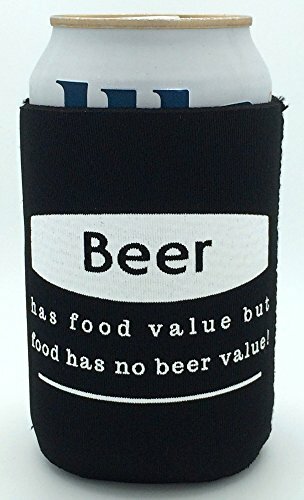 Beer Koozy: Food Has No Beer Value - BeerRevolt! Beer lovers rejoice… this unique cozy will keep your drink cold while adding humor to every occasion. Printed in the USA on premium, 3MM thick neoprene that is less likely to tear than other cheap products. Fits most bottles and cans, folds flat and tucks away virtually anywhere and is even machine washable. Easy to slide on and take off even when wet; no more “rocking” the cozy to remove it. Great for gifts, stocking stuffers, to have for parties, camping, in the RV, on the boat…anywhere! Beer has food value…, Blink if you want me., Get your hands off my beer!